Using diluted bleach baths to treat a serious skin infection can raise eyebrows, particularly in young children on whom you would assume household bleach would be too harsh. But this popular, old-time remedy has been gaining popularity in treating serious skin problems, including hard-to-control eczema and/or methicillin-resistant Staphylococcus aureus (MRSA) infections. Atopic eczema is one of the most common skin disorders in children and one that can be made dramatically worse with MRSA. While antibiotics have long been used to treat these conditions, increasing concerns about antibiotic overuse have led some doctors to embrace bleach baths as a complementary form of therapy despite the lack of clinical evidence. Sodium hypochlorite (NaOCl), a key component of bleach, has been in use as a disinfectant and antiseptic since the early 18th century and was widely used during World War I to prevent wound infections in injured soldiers. A 2007 study conducted by researchers at Bryn Mawr College used twice weekly baths comprised of two tablespoons of six percent bleach per gallon of water. After six months of treatment, the number of S. aureus skin infections dropped from 60 per year to only six. A 2008 study from Northwestern University reported a nearly five-fold decrease in recurrence of atopic eczema in children between the ages of 6 months to 17 years. A 2011 study from Washington University showed that daily bleach baths, when given with an intranasal antibiotic, eradicated 71 percent S. aureus infections after four months. Despite the positive results, the relatively small number of participants (from as many as 300 to as few as 31) limits any interpretation one can make. Of these, only one — the smallest — has been a randomized trial. No large-scale study has yet been conducted. As a rule, you should never give your child a bleach bath without first consulting a pediatrician or pediatric dermatologist. Your child may have a bleach intolerance, and undergoing the treatment may worsen rather than improve the condition. Mix one-half cup of regular household bleach into a bathtub filled one-quarter with lukewarm water. Bathe your child for about five minutes. Avoid getting water into the child’s eyes or mouth as this can cause irritation or upset stomach. 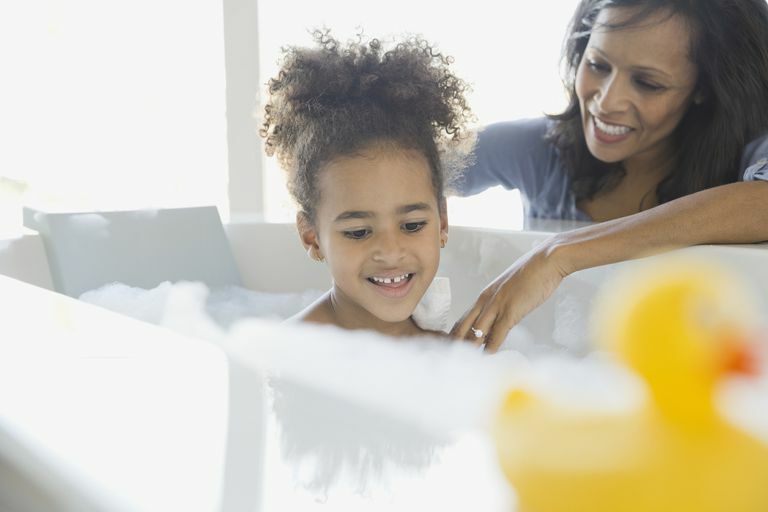 Gently rub a moisturizer on your child's skin within three minutes of getting out of the bath, especially if there is eczema. Repeat the dilute bleach bath twice a week until your pediatrician tells you to stop. If there is any skin irritation, speak with your doctor about other home treatments that may help. Some dermatologists recommend washing with a chlorhexidine cleanser (Phisohex, Hibiclens) as an alternative to bleach baths. Diluting a bleach bath won't help as the lower concentration would unlikely be able to fully neutralize the bacteria. Your Kid Has Diarrhea: Could It Be a C Difficile Infection?